PJ Wood multi-functional, broad, smooth, and rectangular top folding TV tray and snack table in Black finish can easily hold a large meal, snack foods and laptops. With the upright stand, it can be stored discretely when not in use. Stylish design and well crafted from plantation rubberwood, and made in Thailand. 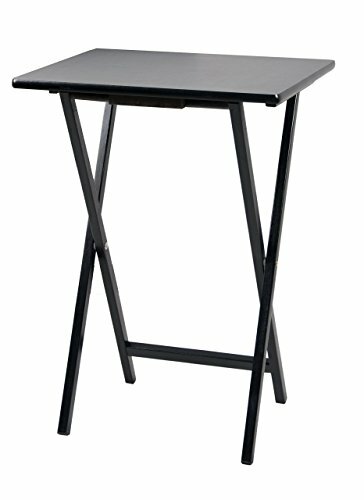 The versatile and sleek folding table is sturdy and durable for everyday use. Ideal for any snacks, coffee, food, drinks, magazines, remote controls on. The table folds away easily to save space, and is lightweight for you to move and use whenever required. If you have any questions about this product by PJ Wood, contact us by completing and submitting the form below. If you are looking for a specif part number, please include it with your message.